This was so easy to assemble, and I have NO idea how to make it fold up small again despite the lady smiling at me from the instructions, but it’s such a lovely and unusual tent. It’s Daddy Pig’s campervan and the boys have been serving breakfast [as you may have seen] through the hatch to Daddy and also using it as a clubhouse/den and filling it with sofa cushions to keep us grown ups out. I love that it’s beachy and as soon as we get another chance [we had none thanks to the weather and Grandad being so poorly/car blowing up] we’ll be taking it with us to have fun in Bournemouth. Hero LOVES this tea set. He will drink hundreds of teeny cups of squash at his tea parties as opposed to a few sips from a big glass – and although we thought he would be sad he couldn’t fill this one up, he’s really enjoyed it. The house teapot looks just like the house from her series, and when its door is pressed, the windows light up and it plays the theme tune! And although it can’t be filled up, when it’s poured out in a pretend manner, there are cute glug sounds – and when the roof [top] is opened, Peppa oinks! Despite me reminding the bigger boys [although they aren’t that much bigger] that this is Hero’s scooter, they all love this one and slowly wheel around the house on it like it’s a mini segway. It’s very easy to steer unlike a lot of scooters we’ve tried, and Hero loves the pink colour – and that it’s very small, just like him. If you love the Bing Bong song, you’re going to love this Peppa! When her little trotters are held [there are little metal sensors on them], she starts singing with you – and when you let go, she stops! Peppa also comes with batteries which made our lives so much happier than when we’re trying to find enough, open a brand new toy up and install them before it can be played with. This Peppa is also very soft and sits nicely on Hero’s bed. This was the handiest puzzle on one of our rainy days here in Peppa Pig land [Hampshire]. Once the puzzle is put together, it’s black and white on the flip side and can be coloured in! The boys loved styling the picture to their own colour scheme, and we bought one of these for their cousin’s birthday too. Jensen bought one of these sets from Peppa Pig World a few years ago when it first opened and he still loves it to this day. Being able to recreate Madame Gazelle’s playgroup is so much fun for them, and the little characters are the perfect size for them. We all love activity books – and so we sent the boys to Granny and Grandad’s house with this one! Later that week we got a postcard from the Jones boys and Peppa from this book. It’s one of their favourites – especially as Grandad bought them some sweeties at the post office when they went there, haha. This is MY favourite. I wish we had been able to get these when Jensen was little and just started eating. I could have put this in my bag for our [many] trips to Paulton’s Park to visit Peppa and have had his little sandwiches in the snack pot and a drink too. It’s brilliant and the boys all love it too. It’s been leak free for over 10 trips to far, which is about 6 more than any other flask we’ve recently tried! 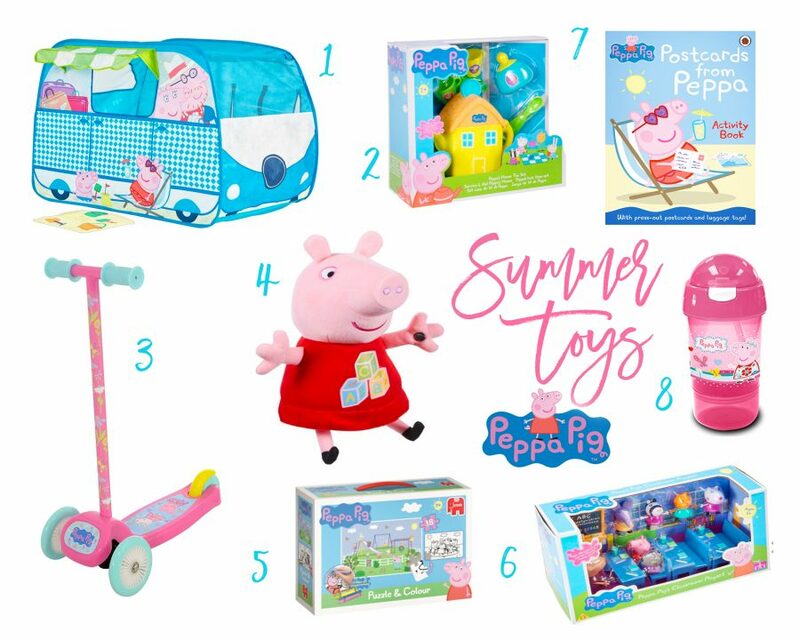 We hope you love our choices – there are so many amazing Peppa products out there, it can be hard to choose!